View all the entries into the 2015 LAALcomp here, with information from their creators and links to their books on the Living Archive website. Click here for an overview of the competition. sentences for lots of parents to practise and say. The parents liked this book as they remember it from their school days. They also thought it would be fun to make the sea box used in our story. We also have pictures of ‘dhalimbu’ in our playgroup. Method 1. First we chose the book and talked about what art we could do so that the children would be involved. The parents came up with the idea of using paper plates for the dhalimbu. The parents decided that they would make the dhalimbu and the children would make the sea box. At activity time, the parents helped the children paint and decorate the box, fish, octopus, seaweed. We talked to Helen Rrikawuku to get permission. She agreed for us to use her story. She was in Darwin. 2. Then we decided to take photos of the craft using our iPhone and whatever we had at the playgroup. 3. Then we had an idea—we thought maybe we should take photos of babies and put name labels of Ḏiŋ’, Ḏaŋ’ ga Ḏoŋ’ on them. This didn’t work as the babies couldn’t sit still! So we went back to the craft photos idea. 4. During playgroup time, mothers and some staff recorded themselves reading the story into the laptop using Audacity software. Some parents had to practise a little so that they could project their voice well. All the parents and staff loved doing this! 5. Then one of the parents decided to write a song about the story so that we could sing it at playgroup. So we helped each other write the song using a tune of a song we are familiar with. 6. We taught the song to all the other parents at playgroup the next day. Then we tried to record it. The recording wasn’t good. 7. Luckily, Stamp Music ( a song writing/recording team) were visiting the school and were scheduled to visit us. We told them our story and they happily agreed to record our new song. We loved recording this and hearing ourselves. 8. One of the dads at the playgroup listened to the song and volunteered to make an animation to go with the song because it sounded like a lullaby. He showed the animation to the parents at the playgroup and got feedback from them. 9. The finished product was put together using Movie Maker and is a combination of everyone’s hard work. We enjoyed making the resource and our parents and children already love it! I chose The Mud Monster book because I found it was a nice and simple story. As a scientist I found the idea of dissolving (with water) the fears (the monster) was very fun and interesting. Also it was easy to follow for me (I’m originally from Spain) as the book was in English too. I also enjoyed learning about the Milingimbi community and the remote area of Australia where they live. I have used Blender, that is an open source software to produce an animation movie inspired in the story of The Mud Monster book written by Jennifer Baker. The animation includes the original illustrations by Francis Rrikili in order to acknowledge her work. I have also included captions in English. Along this journey I have contacted quite a lot of people by email. First of all Jenny Sherrington, that is the Principal of the Milingimbi School, kindly put me in contact with Jenny Robins, Capacity Building & Network Coach at Milingimbi CEC. She has been really involved in this project and I would like to specially thank her. She put me in contact with the author of the book, Jennifer Baker. Jennifer Baker was thrilled about the idea of her book being part of this competition. Jennifer is currently living outside the community. As Ms Baker has no personal email I have been in contact with her through Fiona Kennedy and Tom Hughes, at the Shalom Christian College, so they have also been very helpful. Jennifer Baker, in a visit to the community due to personal reasons, contacted Francis Rrikili, the illustrator of the book and she kindly gave her the permission to use her illustrations in the animation. Finally, Jennifer Baker with the help of Jenny Robins were able to record Jennifer’s voice telling the story of the Mud Moster in Gupapuyŋu, she noticed that some text of the book was not correct and updated it in the voiceover. Unfortunately we couldn’t incorporate the corrected captions in Gupapuyŋu before the deadline but we will incorporate them later. From the creator: Multhara Munungurr, the translator is a very special friend who I taught with many years ago at Yirrkala. She is an amazing educationalist who translated a traditional tale that my kids in Year 3/4 in Fremantle in WA can know and relate to. We read the story and the children chose a section of the story to represent orally and visually. Kahootz, a 3d animating software was used to illustrate their section and we recorded the children telling the story in English with a video camera. Melissa’s Gumatj was recorded into a mobile phone. The oral and visual sections were edited together by Deborah Sear and took many many many hours to complete. The iMovie was then converted to Quicktime. Carmel Ryan chose this book because she produced it in 1984 when she first learned to write Arrernte and was becoming a teacher. For those reasons it has sentimental value. And all these years later she is still producing Arrernte material and teaching her language! The skills she has gathered over those years led her to revise the original text, and correct the earlier version. Although it was written a long time ago, the story is still useful and it was inspiring for creating a teaching sequence as well. We used PowerPoint because it is readily available in schools, and we were familiar with it. It also has features for enhancing colours of the pictures. And we were able to make a recording and embed a sound file on each ppt slide. The Powerpoint presentation was later converted to video. Kanimuni kunak la Kurnpirripirri is about a crocodile and a pig, and combines the pictures from the original book with a video of toys representing the characters in the story. It was created by the students at Warruwi Community School on Goulburn Island. From the creator: This Olgamen is a very good storyteller. I found it hard to choose, but I really like her funny stories. I made a video of myself reading the book. From the creator: This is an important story, with beautiful illustrations. A number of entries into the LAALcomp used iBooks Author to create their entries. Currently we can’t display ibooks within our archive, as they only play on Apple devices (but we are working on a solution for our website), but you can download them here and play them on your own device. 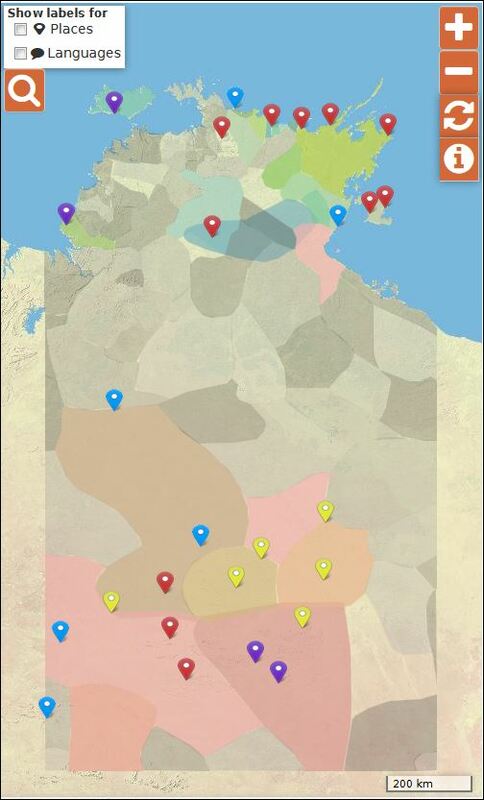 Entered by Kathy Gothadjaka from Elcho Island.